A new type of utility energy services provider has taken root and is now growing in California. Operating within the service territories of the state’s major investor-owned utilities, community choice aggregators, known in short as CCAs, are serving as vehicles for greater consumer choice regarding how and from what resources electricity is produced, as well as from whom it is purchased. Enacted in 2002, California Assembly Bill 117 (AB117) opened the door for CCAs to be created. It wasn’t until May 2010 that CCA proponents and community leaders in Marin County launched MCE, California’s first CCA, however. The concept gradually caught on and a surge of interest, as well as creation of new CCAs, occurred in 2015. The expansion continued through 2016 and thus far into 2017, Peninsula Clean Energy CEO Jan Pepper told Solar Magazine in an interview. Taking place in California, offering energy utility customers alternative utility energy services is adding momentum to realization of the Golden State’s renewable energy and climate change action goals and objectives. New solar energy projects are being built and greater amounts of emissions-free electricity is flowing across California’s power grids as a result. Recurrent Energy, a subsidiary of Chinese-owned Canadian Solar, recently signed a 15-year purchase power agreement (PPA) with Peninsula Clean Energy to off-take emissions-free electricity from the CCA’s 100-MWac (megawatt, alternating current) Mustang Two solar power project. Construction is to begin in 2018 in central Californa’s Kings County and come online in 2019. 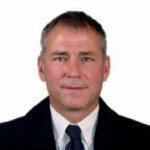 Californians have been and are at the leading edge of the wave of fundamental change that is sweeping across power and energy markets and industry in the US and worldwide. Utility customers have been taking to solar, wind and other forms of local, distributed renewable energy in droves, while government and regulatory authorities continue their quest to create an equitable, efficient, effective and integrated institutional framework to promote and foster this burst of technologically driven power and energy evolution. CCAs are a growing aspect of this policy agenda. 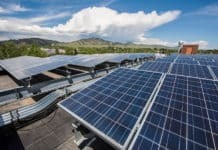 They operate locally in towns and cities within the territories of the state’s largest investor-owned utilities and they’re playing a growing role in providing access to solar and other emissions-free renewable energy resources to consumers who would like to make use of “green” energy to a greater degree than their traditional utilities offer. Peninsula Clean Energy launched in 2015 as a non-profit organization essentially owned by its customers, which span the length and breadth of San Mateo County north of San Francisco – 20 cities and unincorporated areas with a total 290,000 customer accounts. As per AB117, all PGE’s customers in San Mateo are automatically enrolled as Peninsula Clean Energy customers unless they opt out and choose to remain with PGE, Pepper explained. The CCA conducted its inaugural enrollment drive in 2015 and enrolled the rest of its customers this year. CCAs generate electricity, giving consumers greater choice in choosing how that electrical power and energy is produced. California’s distribution utilities, Pacific Gas & Electric in Peninsula customers’ case, see to delivering that electricity to Peninsula’s customers. Climate change and renewable energy are high-profile issues in the northern California county. 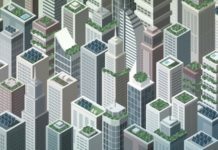 “Basically, each city in San Mateo County has its own climate action plan outlining the actions they want to take to reduce greenhouse gas emissions. One of the key ways they can do that is to clean up their electricity supply,” Pepper said. Peninsula Clean Energy began building out its own renewable energy generation capacity and acquiring “green” electricity from the very beginning. In addition to the 100-MWac Mustang Solar II, the CCA has signed a contract to off-take electricity from a 200-MW solar project due to be completed in 2019. It has also entered into short-term “green” energy supply contracts. Peninsula’s net metering program provides an added incentive for its customers to go “green” on energy. The CCA pays customers with self-generation capacity, such as a home or business solar energy system, $0.01 per kilowatt-hour more for the electricity they dispatch to the grid than PGE offers, a rate that’s stipulated in California’s state-wide net metering rules. 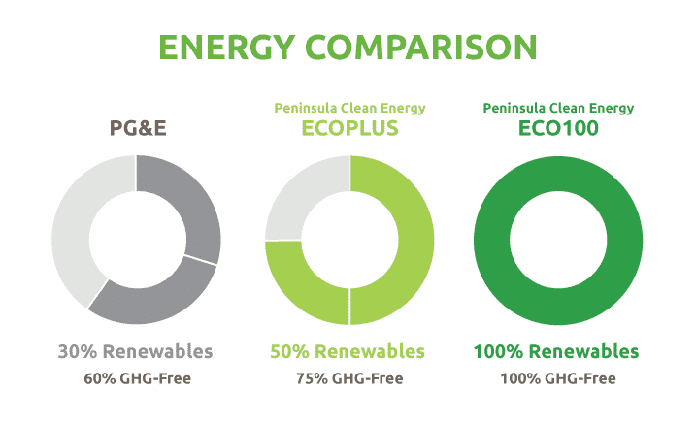 How Peninsula Clean Energy ECOplus and ECO100 compare with PG&E. “We ‘true up’ their solar production,” Pepper added. 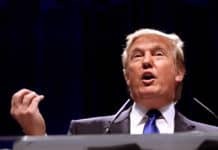 If they produce more energy than they consume, we will pay them an extra one cent per kilowatt-hour for that excess solar power as a way of encouraging greater use of solar energy. There are eight CCAs up and running in California today. More than a dozen more communities, towns and cities are exploring launching one of their own, according to a July 2017 study produced by researchers at the University of California, Los Angeles’s (UCLA) Luskin Center for Innovation. Set on a course of innovation, development and growth that parallels that for solar, wind and other clean, renewable energy in California, CCAs are expressing strong interest in lithium-ion and other advanced, battery-based energy storage solutions, according to Aric Saunders, director of business development at San Franciso-based ElectrIQ. Deploying battery-based energy storage holds out prospects of significantly improving CCAs ability to expand their solar and renewable energy generation capacity and deliver higher quality services to their customers, Saunders told Solar Magazine. 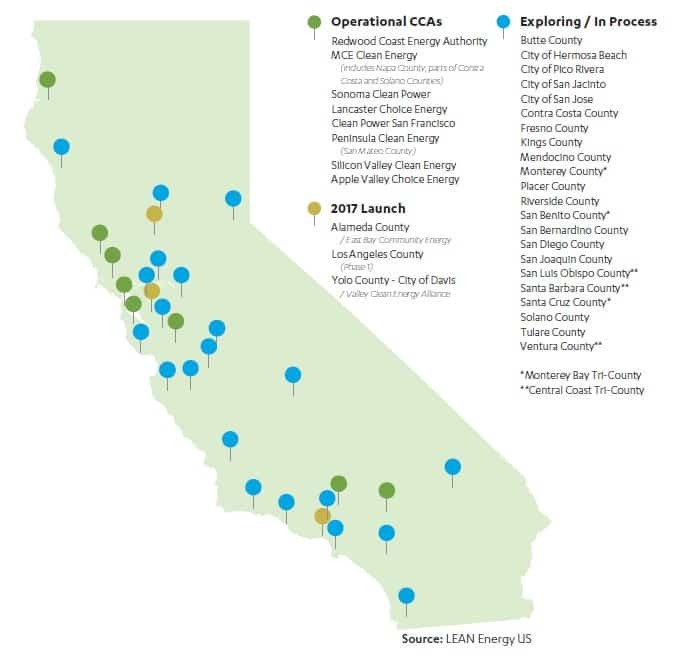 In addition to increasing the resiliency of CCA energy services and the visibility and control of customer-sited distributed energy resources (DERs), that extends to CCAs being able to generate revenues by participating in California’s wholesale power markets and improving customer engagement and retention. “If you look at most industries today, they’re being disrupted by providing choices to customers where they previous had none. It also seems that where there were these monopolies the customer service isn’t the primary focus,” Saunders said. This creates opportunity. You see people looking into peer-to-peer energy, transactive energy, and real-time pricing. These are the Uber/Airbnb models for energy. You see homeowners wanting to take control of their energy sources and self consume all their solar generation and not need the utility. All of these can eventually benefit the utilities or CCA’s if they’re willing to adapt. CCAs are raising the level of competition and exerting downward pressure on consumer costs in California’s retail electricity marketplace. They’re also making it “greener” and hence, healthier.